Elmwood Playhouse of Nyack NY will be presenting “Death of a Salesman”, written by Arthur Miller and directed by Alan Demovsky. The recipient of the 1949 Pulitzer Prize for Drama and the Tony Award for best play, “Death of a Salesman” is indisputably a landmark of American art. “Death of a Salesman” runs July 13, 2018 thru August 4, 2018 Fridays and Saturdays at 8pm, Sundays at 2pm with an additional Thursday performance on August 2, 2018 at 8pm.Tickets are $25 / $22 Seniors and Students. Willy Loman, the ceaselessly striving salesman, returns to his New York home after a failed New England trip. Driven by hopes of success far greater than he can achieve — for himself and his two sons — Loman and his wife confront the American Dream in Arthur Miller’s towering masterpiece. 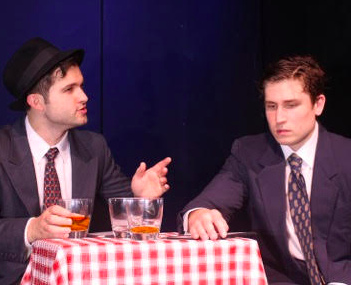 “Death of a Salesman” features Andrew Lionetti (of Westwood, NJ), Robin Peck (of River Edge, NJ), Michael Metta (of North Arlington, NJ), Aaron Newcome (of Nyack, NY), Arthur Chill (of Hawthorne, NJ), Bernie Garzia (of Orangeburg, NY), Andrew Greenway (of Piermont, NY), Sam Ruck (of Tappan, NY), Mimi Leahey (of West Nyack, NY), Russell Holland (of Teaneck, NJ), Elizabeth Mayer (of Tappan, NY), Linda Garzia (of Orangeburg, NY), Rich Ciero (of Oradell, NJ). Elmwood Playhouse is located on 10 Park Street in Nyack, NY. For reservations, information or directions, call the Elmwood Playhouse Box Office at (845) 353-1313, or visit www.elmwoodplayhouse.com.